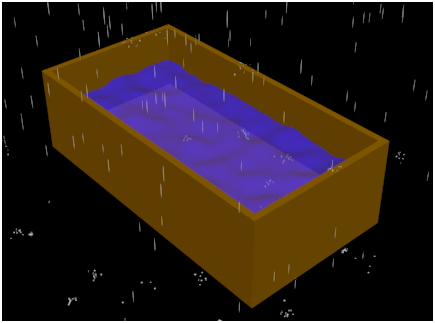 Creating this 3ds Max rain tutorial was fairly easy. Basically, I just set up two plane objects, one smaller and above the bottom. Then I open the Particle View in 3ds Max for editing events. I can set the position and speed of the particle flow (rain and rain drops), set the gravity force with Space Warps. Change the bounce of the particles by using a UDeflector (collision control), again using Space Warp. I can change how long the rain drops are going to last by setting the Particle Age. I can create splashes for each rain drop by setting the Offspring. I can create the rain drops from simple spheres, as you will soon read. Also, I add a water material to the rain drops.